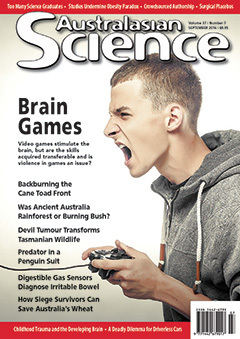 A growing body of research is finding that video games stimulate the brain, but are the skills acquired transferable and is violence in games really an issue? Ancient wheat varieties that survived the Siege of Leningrad have rare genes that offer resistance to important diseases affecting Australian wheat. Miniature video cameras and GPS have given an underwater bird’s-eye view of the hunting behaviours of the world’s smallest penguin. Brushtail possums are boldly venturing away from the safety of trees to forage on the ground as an unprecedented transmissible cancer removes their major predator, the Tasmanian devil. Could the cane toad’s march through the Kimberley be stopped in its tracks by introducing less-dispersive toads ahead of the invasion front? Mistrust is a significant but not insurmountable barrier to the acceptance of genomics by Indigenous people. The challenges facing Australia in the 1960s have not been addressed, and a new challenge will need to be overcome before we can really become a lucky country. conSCIENCE: Can Journal Publishing Be Democratised? An experiment in academic publishing has tested journal practices and questioned whether the autocratic power of editorial boards needs to be returned to researchers. Directions: Can Australia Meet the Paris Climate Challenge? We need to accelerate our efforts to reduce greenhouse gas emissions. Different mangrove areas in the same region provide different ecosystem services. Mapping these is important when deciding where conservation investment should go. A study published in Science has found that people generally approve of autonomous cars that have been programmed to sacrifice their passengers if it will save others, yet these same people aren’t keen to ride in such “utilitarian” vehicles themselves. Three recent studies have cast new darkness on the paradox that overweight adults are more likely to get diseases such as diabetes yet seem to live longer. Palaeo-ecotours could generate income for research and conservation at fossil sites. Lowe Tech: An Energy Wolf in Greens’ Clothing? Is the creation of a single government portfolio encompassing energy and the environment a fatal conflict of interest? Is there any science behind the theory that a child’s visual, auditory or kinesthetic learning style should determine how they’re taught? A new study has identified the neurological basis for why some adolescents who have experienced childhood trauma are resilient while others are prone to mood disorders. Out of this World: How Much Does the Milky Way Weigh? Charles Foster has tried to reconnect with the animal world by living as a badger, a fox, a swift, a deer and an otter. Earthquake researcher Assoc Prof Mark Quigley explains the lessons learned from recent major earthquakes into how to better prepare regions at risk, the value of strong science communication to affected populations during crisis, and the importance of developing appropriate building codes in anticipation of the Next Big One. A new report finds that the increasing number of science graduates are having difficulty finding relevant employment. What did the Universe look like when the first galaxies formed? What is dark matter? And is there life out there? These are some of the big questions the Square Kilometre Array will be trying to answer. Over the centuries there have been some amazing archaeological discoveries. Let's take a look at the greatest ones. Browse: Can Trees Cope with the Third Degree?